The Volkswagen Santana is a three-box sedan, based on the second-generation Volkswagen Passat (B2). It was first introduced in 1981 and the last one was built in China on 16 January 2013. The use of the "Santana" badge rather than "Passat" echoes the use of different names for the sedan versions of the Polo (Derby) and Golf (Jetta). In North America, it was also known as the Volkswagen Quantum. In Mexico, it was named the Volkswagen Corsar, while in Argentina it was sold as the Volkswagen Carat. 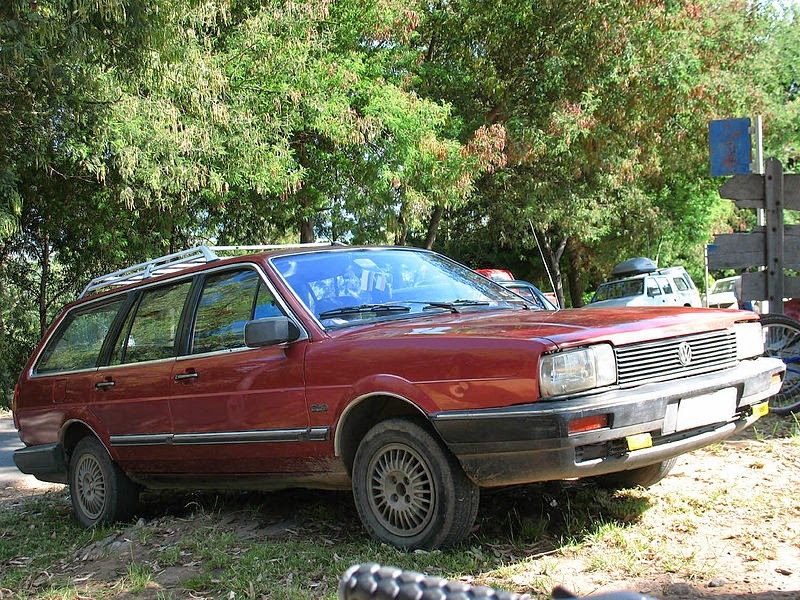 In Brazil and other South American countries it was known as the Santana, while the Passat Variant B2 wagon was marketed as the Volkswagen Quantum. In Europe, the Santana name was dropped in 1985 (with the exception of Spain, where the Santana nameplate was retained) and the car was sold as a Passat. European production ended in 1988. The final Chinese versions are named Santana Vista, and the name Santana is used on a new 2013 model, slightly smaller and based on the Škoda Rapidand SEAT Toledo. 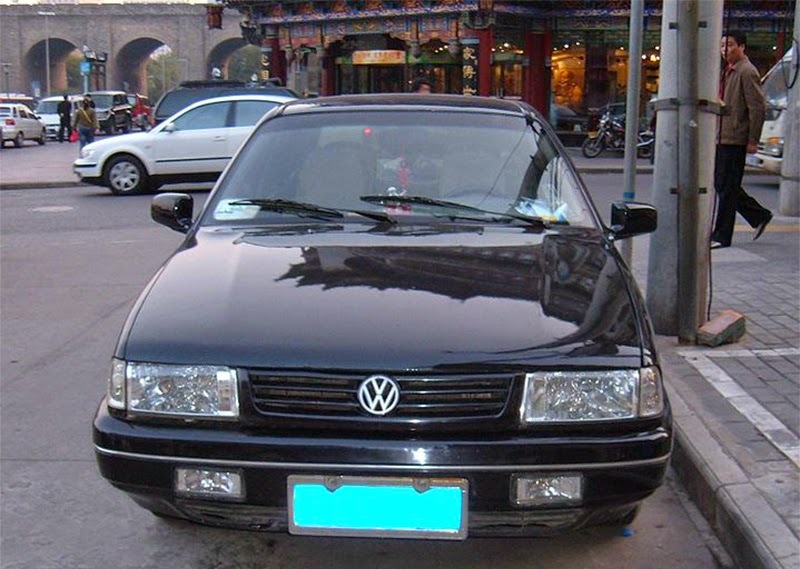 Chinese Volkswagen Santana station wagon, in Shanghai. The Santana's biggest success was in China. The Santana (B2) had been built in China on a small scale trial basis by the Shanghai Tractor Automobile Corporation (STAC), predecessor of the SAIC group, since 1982. The first 100 cars were built from CKD kits delivered from Germany. In 1984, Volkswagen signed a contract with STAC, along with the China National Automotive Industry Corporation (CNAIC) and the Bank of China to form the Shanghai Volkswagen Automotive joint venture in October 1984. The first assembly line of the Santana started in October 1985. In September 1986, the 10,000th Santana was built in China. The car and venture laid the ground-works for China's mass motorization. The drive to fully localize production became the impetus for the Chinese auto parts industry: In 1986, the quota of made-in-China parts was below six percent. In 1995, the local content quota stood at 89 percent. Initially launched with a 1.6-litre petrol engine, the Santana was updated with a 1.8-litre petrol in 1987, first available in the Santana Variant station wagon introduced by Shanghai in 1986. The first Santanas were all originally equipped with a four-speed manual transmission. The 1.6 remained available in the sedan until as late as 2006. The Santana has had a number of updated features added since the original 1985 model. Some updated features the Santana has been include with are Bosch electronic fuel injection system, a 5-speed manual, a third brake light, improved back seats, hydraulic clutch, MP3 and CD compatible radios, ABS brakes with electronic brake distribution. In 1991 the Santana 2000 was put into development for China with the aid of Volkswagen do Brasil. It was introduced in 1994 and started mass production in 1995 with a longer wheelbase 2,656 mm (104.6 in) and rear doors than its Brazilian counterpart. In 2004, the Santana 3000 succeeded the Santana 2000. It was the first design that the Shanghai Volkswagen Automotive joint venture designers had undertaken by themselves. The Santana 3000 was also the first in the Chinese developed Santana series to be available with optional ABS brakes with electronic brake distribution, electronic differential system, a multi function display system, and a sunroof designed by the German Webasto company. The 2.0-litre engine was added to the range in June 2006. 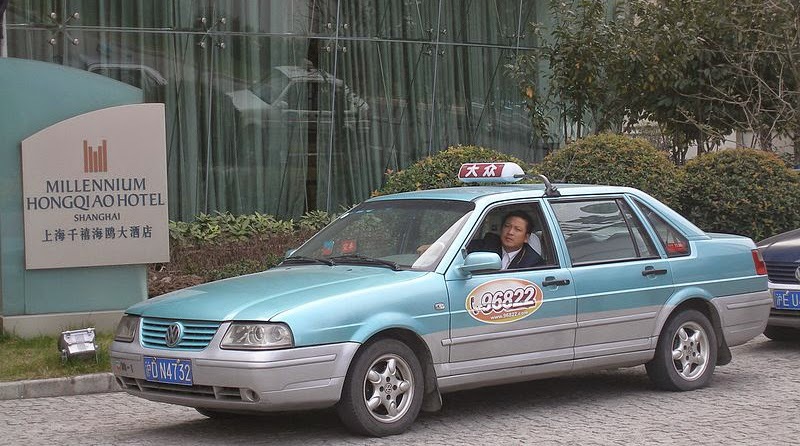 In January 2008, Shanghai Volkswagen Automotive released the Santana Vista (Zhijun) and Santana Vista (Changda) (Taxi model), featuring front and rear visual updates and minor chassis modifications. The Vista can be recognized by its mesh grille, chrome accents located low on the bumpers, and redesigned taillights with circular elements. 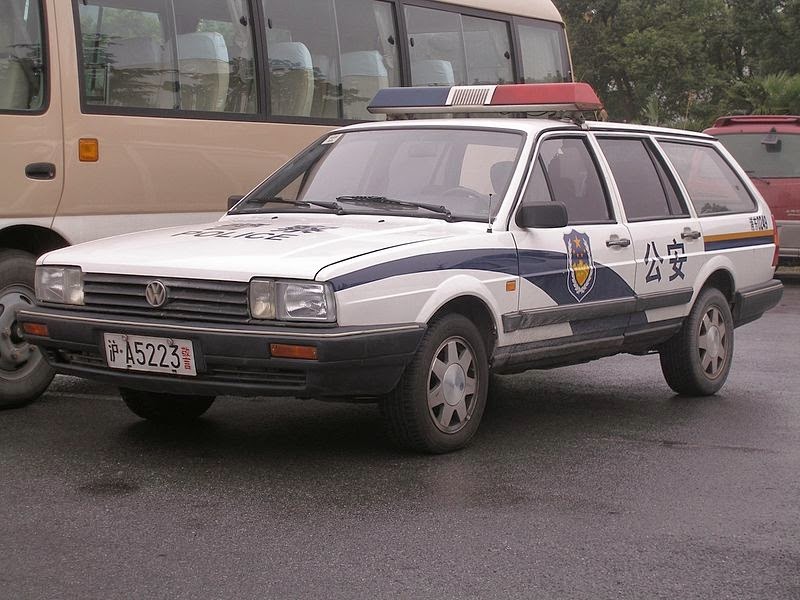 As of May 2011 the original German designed Santana (both sedan and Variant versions) was still sold in China alongside the updated Santana Vista, and are still popular with taxi and police fleets, as well as with private buyers. A 1.6-litre version of the Santana Vista (1,595 cc, 70 kW or 95 PS) has been added to the bottom of the lineup to further boost sales. There were 3,213,710 units made since CKD production began in 1983 up until May 2009. 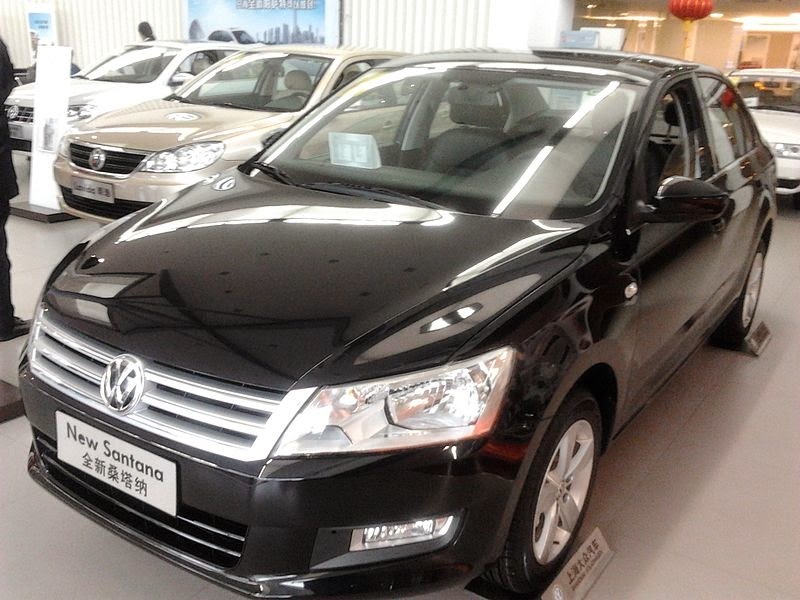 Nonetheless, Shanghai Volkswagen Automotive decided to discontinue the Santana in 2012, although production only actually came to a halt on 16 January 2013. On October 29, 2012, the new Santana was introduced at Wolfsburg. The new Santana is based on the 'New AO5+' (PQ25) platform and has been redesigned for more power and a sleeker design. Aiming at a full partnership with Volkswagen, Nissan's then President Takashi Ishihara decided that producing the Santana for the Japanese market would be a good stepping stone. Negotiations began in 1981, and by February 1984, Nissan begun license production of the Santana at its Zama plant in Kanagawa, Japan. The Nissan Santana received the internal model code M30. The price of the Nissan Santana was considerably lower than of imported Volkswagens. Nissan's Santana was changed for Japan with a right hand drive wiper layout (parking on the passenger side) which, as well as a new linkage mechanism, also required a new bonnet pressing as there were recesses in the trailing edge for the wiper pivots. VW-built cars, in common with some of the maker's other models at this time, such as the MKII Golf, had the same LHD wiper pattern regardless of steering wheel location. At introduction, the Nissan Santana was available with three different engines: A 100 PS (74 kW) 1,781 cc four (Li, Gi), a 110 PS (81 kW) 1,994 cc five (Gi5, Xi5) and a 72 PS (53 kW) 1,588 cc turbodiesel four (Lt, Gt Diesel Turbo). All came with a five-speed manual transmission as standard, while the gasoline engines were also available with a three-speed automatic. The Nissan Santana was 5 mm narrower than its German counterparts, so as to avoid a massive Japanese tax on cars wider than 1690 mm. Additionally, the grille and headlights were unique to the M30 Santana. In May 1985 the Xi5 Autobahn version was added to the lineup, offering velour sports seats, electric sunroof and 14-inch alloy wheels. In January 1987 the Santana received a facelift, with a new fascia and new larger bumpers. The Turbodiesel was discontinued, leaving only gasoline-engined versions. The 1.8-litre Gi version was down to 91 PS (67 kW), while the Li and Gi5 equipment grades were dropped. The Xi5 Autobahn was now available with a new engine, however, as a DOHC version of the 2-litre five appeared with 140 PS (103 kW). With sales, originally aimed at 4,000-5,000 per month, only having reached 50,000 over seven years, Nissan ended production in October 1989. Sales of remaining stock continued until May 1990. Instead of renewing the production license, they began selling the new third-generation Volkswagen Passat through their dealer network. As Volkswagen and Toyota began cooperating in 1991, sales of Volkswagens through Nissan dealers ended. The Santana entered production in Brazil in June, 1984. It was originally sold as a 4-door and 2-door saloon, but a station wagon named Santana Quantum (later simply Quantum) was launched in July 1985. The 2-door saloon was exclusive to Brazil. The engine range consisted of two versions of the familiar 1.8-litre Volkswagen EA827 engine, running on ethanol or petrol. In May 1988 it gained the option of a 2.0-litre engine (petrol or ethanol). Thus equipped they were known as Santana/Quantum 2000. Transmissions included a 4-speed manual (for the first two years), 5-speed manual (first as an option but made standard in 1987), and for the top line CD (later GLS) a 3-speed automatic. In 1991, Volkswagen do Brasil then engaged in a joint venture with Ford called AutoLatina, decided to retain the Passat (B2) shaped saloon and wagon instead of building the newer third-generation Passat (B3). Thorough changes to the bodyshell, boot line, front and rear guards, meant it looked considerably more modern than its predecessor, if not quite at par with the B3. Under the terms of AutoLatina, this "new" Santana was also marketed as the Ford Versailles in Brazil and as theFord Galaxy in Argentina. The 3-door (later 5-door) station wagon was sold as the Ford Royale. 1991 also marked the introduction of ABS brakes and catalytic converters, both firsts for the Brazilian car industry. It received a small face-lift for 1994, and another more extensive one in 1998. In 2002, the Quantum was taken out of production, and then, after more than two decades and years of dropping sales, the Santana was retired from the range in June 2006. It sold 548,494 units during its production run. 1987 Volkswagen Corsar CD for Mexican market. The Santana 4-door saloon was introduced in Mexico in February 1984 as the Corsar CD. It was assembled in the Puebla plant with most German components. The only engine available for the whole Corsar lineup was the 1.8-litre 85 hp (63 kW) with carburettor. For 1984 and 1985, the Corsar CD was only in one trim available. It had 13” alloy wheels, 185/70 R 13 tyres, velour upholstery (1984 was grey only, and from 1985 it was grey or blue), 4 headrests, AM/FM stereo cassette Radio with 4 speakers, tachometer, power steering. It was sold with 4-speed manual transmission or 3-speed automatic. The only option was air conditioning. Colours for 1984 were: Mars Red, Alpine White, Jade Green Metallic, Cosmos Silver Metallic and Graphite Metallic. 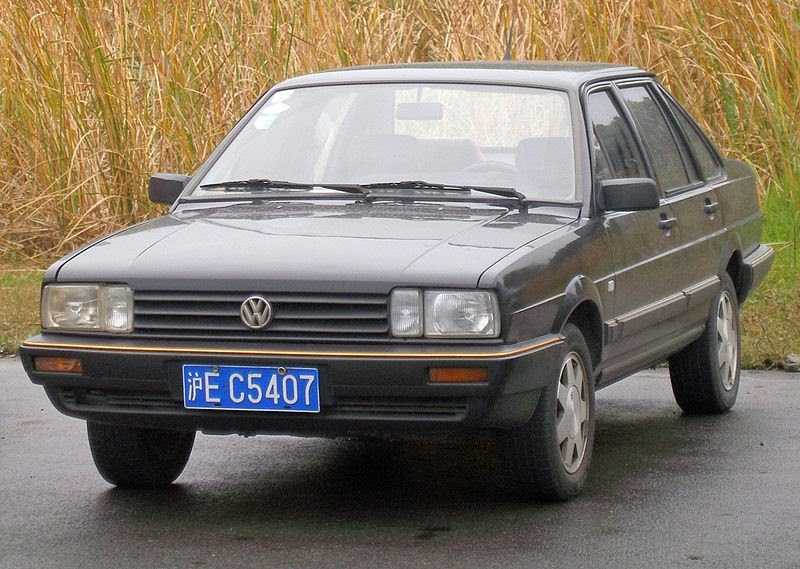 For 1984 and 1985, the Corsar CD had the American Volkswagen Quantum GL looks. 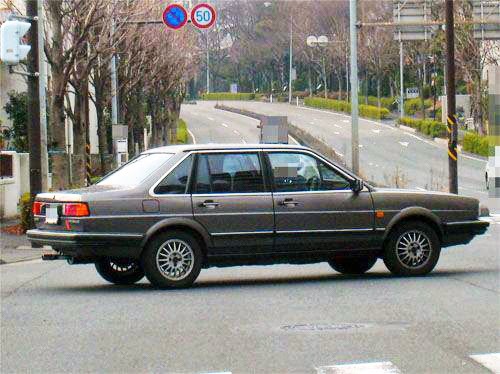 For the 1986 model year, the Corsar CD received new colours, upholsteries, and the 1985 European Passat 4-door sedan's looks. A new 5-speed manual gearbox replaced the previous 4-speed one. The Corsar also had new optional equipment such as power windows, power door locks, and black leather upholstery. 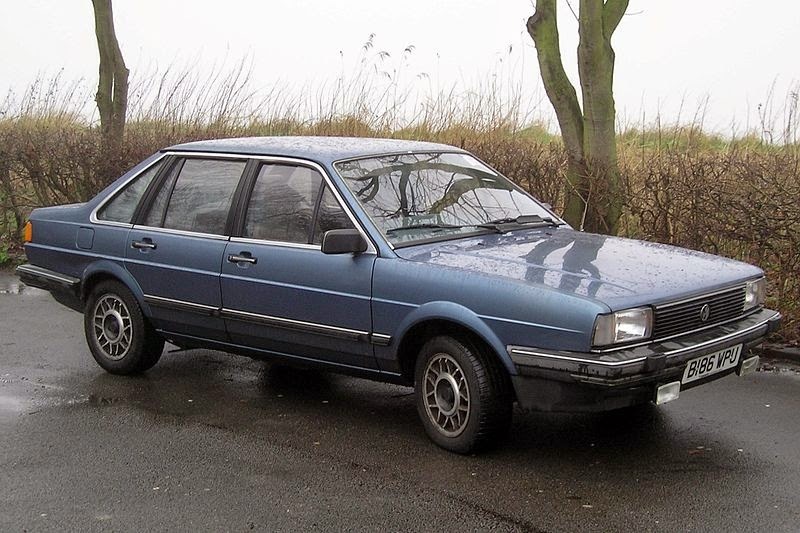 In March 1986, the station wagon body, known as the Corsar Variant (Quantum Wagon in the USA, Quantum in Brasil, and Passat Variant in Europe) was introduced sharing trim levels and engine/transmissions with the Corsar CD saloon. In 1987, the alloy wheels became optional, and the series wheels were steel made with full covers. The Corsar continued mostly unchanged until 1988. By mid-1988, a limited-edition appeared, with double-tone painting (black and silver), black leather upholstery and top equipment available on both the Corsar CD and Corsar Variant. The Corsar was discontinued from the Mexican market by the end of the 1988 model year, since production stopped in Germany (most parts came from Germany), and Volkswagen required its assembly lines to produce the A2 Golf/Jetta for USA and Canada exports. The Corsar lineup is remembered in Mexico with excellent reputation. 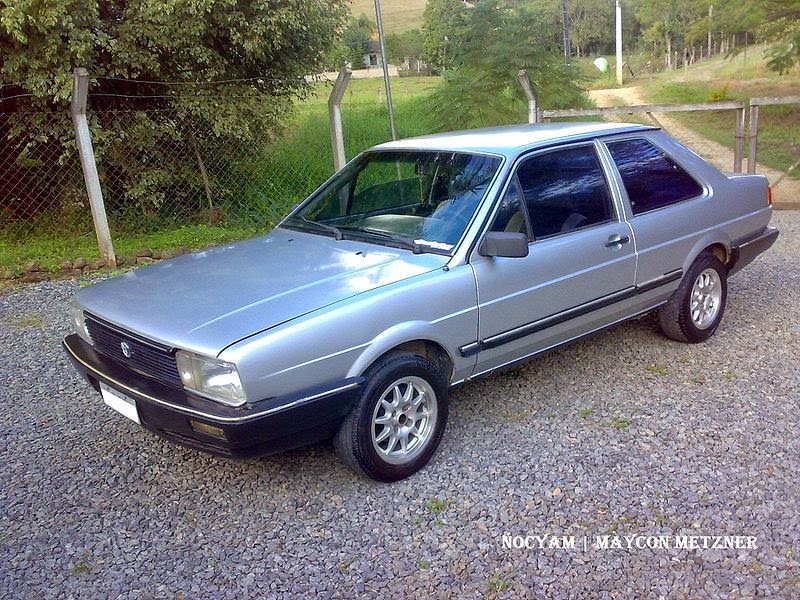 The Santana 4-door sedan started production in Argentina in June, 1987 as the Carat, manufactured by Volkswagen Argentina S.A. (San Justo/General Pacheco, Buenos Aires Province). Production ended in 1991. Last updated on 5 August 2014 at 04:24.